To mark the twentieth anniversary of genocide against Bosniaks of the Republic of Bosnia and Herzegovina on the United Nations designated territory – The U.N. Safe Area Srebrenica – in July 1995, the University of Sarajevo – Institute for Research of Crimes Against Humanity and International Law, the Memorial Center Srebrenica – Potočari, Memorial Center and Cemetery for the Victims of 1995 Genocide, and the University of Tuzla is organizing an International Conference. 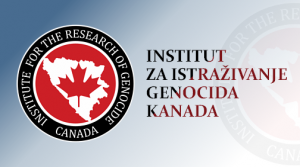 Institute for Research of Genocide Canada was honored with membership in the Scientific Committee of the International Conference. Sarajevo – Tuzla – Srebrenica (Potočari): 9 – 11 July 2015.